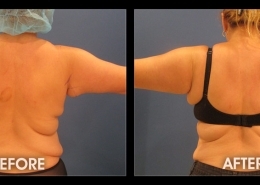 45 year old female who wanted an improvement in minor laxity of the arms but did not want to have a full length brachioplasty. Short scar bracioplasty (hidden in axilla). 6.5cm excised from left arm (113g) and 5.5cm from right arm (132g). *INDIVIDUAL RESULTS WILL VARY. IMAGES DO NOT CONSTITUTE A PROMISE OR REPRESENTATION OF ANY PARTICULAR OUTCOME OR EXPERIENCE.